I’m recommending a play on Syracuse on Saturday afternoon. The Orange started slowly this season after losing three starters from last year’s squad. But we saw the turnaround begin in their 82-77 OT loss to Villanova as a 10-point underdog. The Orange looked in control for most of that game and while they didn’t put the finishing touches on a win, they did build off of the strong performance. Since then, Syracuse has won seven straight games. 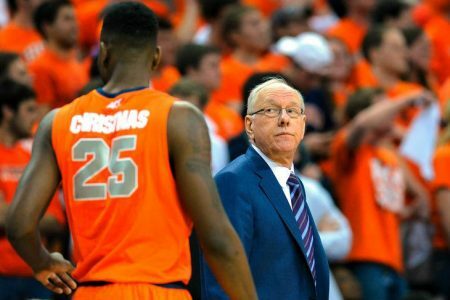 The Orange have held their last five opponents to 59 ppg on 37.8% shooting and the Jim Boeheim matchup zone is working well, holding those opponents to 5.6 made treys per game on 26.7% shooting from behind the arc. Syracuse has been taking care of the basketball on the offensive end, posting a smoking hot 1.71 assist-turnover ratio, averaging over 16 apg and less than 10 tpg in their last five games. I expect more of the same against a permissive Clemson squad that has forced just 5.5 tpg in their last five. The Orange enter on a 20-10 ATS run against teams that force no more than 12 tpg. Meanwhile, the Tigers have covered just 4-of-17 at home against teams that average at least 16 apg. Clemson is shooting horribly over the same time span, making less than 20 FGs per game and they aren’t too hot from the deep perimeter, playing right into the famous Syracuse zone. No Chris McCullough (ACL) for the rest of the season for the Orange, but I expect others to pick up the slack. I’m recommending a play on Syracuse on Saturday. Scott Spreitzer CASHED his first CBB Tapout of 2015 last weekend when Nebraska whipped Illinois. Now grab his CONF TAPOUT GAME OF THE YEAR, a side in blowout mode and backed by combined spots on a 15-0, 100% winning run. Scott enters on a 33-21 Tapout run. Grab the next…CRUSH the books!